Lexie Jaeger avoids commitment. When boyfriends get too serious, she bails out. Her latest love interest, James, thinks it's because of unresolved issues concerning her adoption. When her dying father gives her some tantalizing items, the questions they create in her mind push her to search for her birth family. Will she get the answers she wants, and will she want the answers she gets? Mindy Starns Clark and Leslie Gould team up to produce this tale fraught with dark secrets, tormented souls, and freedom. They hooked me from the get-go, and I finished in record time. This is not your typical Amish book. There's interaction between Mennonite and Amish characters. They're portrayed as people with real problems, heartaches, and family dysfunction. After reading Mindy's book, "Shadows of Lancaster County," I knew I'd be picking up more of her titles. I'm glad I selected this one. Writers: Do you ever think about jumping into the Amish trend? Why or why not? Readers: It's time for you to weigh in. 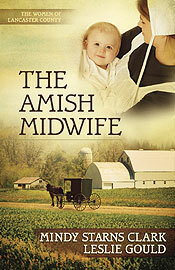 If an Amish book has a great story line with elements of mystery, would you pick it up? I don't usually read the "typical" Amish genre books, but this one sounds interesting. I always love reading your reviews. Thanks Susan! No, I don't think of writing one, since by the time I got around to it, the trend would be over. I love any kind of mystery, Amish or otherwise. Just leave the blood out, please. I've got a Mary Ellis book on my night stand. (An Amish Family Reunion) I've never read an Amish genre book before. I look forward to reading it. 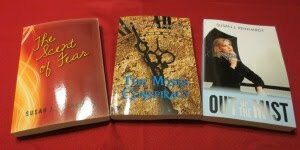 Hi Jess - Her books intrigue me because of the interactions of different groups and the mystery. Hi Jen - Many believe this trend is here to stay. It's still going strong after many years. Hi Jill - Oh my, I can relate. There are so many books I want to read and so little time. Hi Loree - Let us know how you like An Amish Family Reunion. I'm not familiar with this author. This sounds like a wonderful book. I'd definitely pick it up and read it. Stories with compelling characters that live in your memory long after you're done with the book, those are great finds. This book had some interesting twists and turns. Since the characters came from different backgrounds, the way they thought and acted was very different. This sounds like an interesting read, Susan. I wouldn't tackle writing an Amish story. I really don't know enough about them and their way of life, and would have to do too much research to get the setting right. I know that's a weak excuse, and I guess the truth is more that I just don't have a passion for that kind of story. I've read the occasional one because the plot sounded interesting... I like suspense and mystery regardless of the setting so wouldn't shy away just because of the Amish element. Great review, Susan! How neat that you reviewed a co-authored book - maybe a subconscious thing?! My sister-in-law, Stephanie Reed, is finishing up edits to a three book Amish series with Kregel. I'll definitely be picking those up! Have a great weekend! God bless! Hi Carol - An Amish book requires as much, if not more, research than a historical. The culture is vastly different from what most of us know. Hi Maria - LOL! I wondered if anyone would pick up on the co-authored angle. I'll be interviewing Mindy and Leslie here on the blog in about a month. Although the Amish originated in Europe, there are no longer any settlements there. They've spread throughout the U.S. and experienced enormous growth due to their high birth rates. I think you'd find this book a primer on their lifestyle.